Tucked away along the marina side of Clearwater Beach is a rather unassuming little waterfront resort full of hidden charm and "old Florida" appeal. The Ebb Tide Waterfront Resort in Clearwater Beach offers a wide range of amenities to its guests, but perhaps the best of these is peace. Serenity and stillness oozes from every corner of this small hotel. In the lapping of the waves as they brush up against the sides of the marina docks, the graceful flapping of a heron's wings as he glides to a stop on one of the wooden dock pillars, and the inviting deck chairs that just beg for you to take a bath in the warm bask of sunlight hitting the pool's deck. It is a welcomed escape from the hussle and bussle of surrounding cities, and one that keep guests coming back to this boutique hotel again and again. Privately owned, the Ebb Tide Waterfront Resort in Clearwater Beach is a boutique hotel that is part of the Florida Superior Small Lodging Association. An association that is made up of smaller hotels and resorts, all with 50 or less rooms, who are dedicated to providing guests with an authentic Florida experience in accommodations that maintain high cleanliness and service standards. Unlike many hotels you might encounter along Clearwater Beach, Ebb Tide is built more for longer stays. Not to say that you can't book shorter stays (ours was only two nights,) but they are setup for snowbirds and those who wish to stay for more lengthy periods too. This means that you will not necessarily find someone manning the front desk every moment of the day, but the staff is incredibly friendly, and you always have a way to reach them should you need to. The accommodations are beyond roomy, with more than enough room for a large family or even two families to share. Our two bedroom unit had a full living room area with two pull-out couches, large fully-stocked kitchen and dining area too. Two bathrooms meant no worries about everyone getting ready in the morning or at night, and the rooms were very clean with all the modern amenities of chain hotels. One thing to note. Since these units tend to be booked for longer stays, you should bring your own soap, shampoo, dish soap, etc. as those are not provided. However, the kitchen does come stocked with all of the cooking utensils and plates you would need to prepare your own meals and save a bundle on eating out. Free wifi is included in each room as well. Our unit had a wonderful view and we left our windows open all night, even in mid-November to let the cool breeze drift in from the marina. The boys absolutely fell in love with the Ebb Tide's private dock. Fishing poles are available for use for free in the hotel's lobby, and fish bite often. The boys caught more than 10 in one evening using squid bits we purchased from a local bait shop. The pool is heated, and has a fantastic view overlooking the marina. Included pool toys and floats keep the kids busy for hours. Other amenities include books for use in the lobby, and a coin operated washer and dryer found there as well. The shell tree on the way to Caladesi Island. Don't forget to leave a shell of your own. Want to visit the beach? You can walk just a few blocks to Clearwater Beach, or hop in the car and drive just minutes up or down the island to access public parking lots. Pier 60 is famous for their sunset gatherings, and Sand Key Park is just about 10 minutes away with awesome shelling to be had. If you fancy a longer walk, you can access the beach by the hotel and continue to walk North for 1-2 hours to reach Caladesi Island. Be prepared for the walk though, as it is all in sand, and once you get out there, walking is the only way back. Also, call ahead to make sure that the concessions are open, as they will shut them down if there is rough waters. 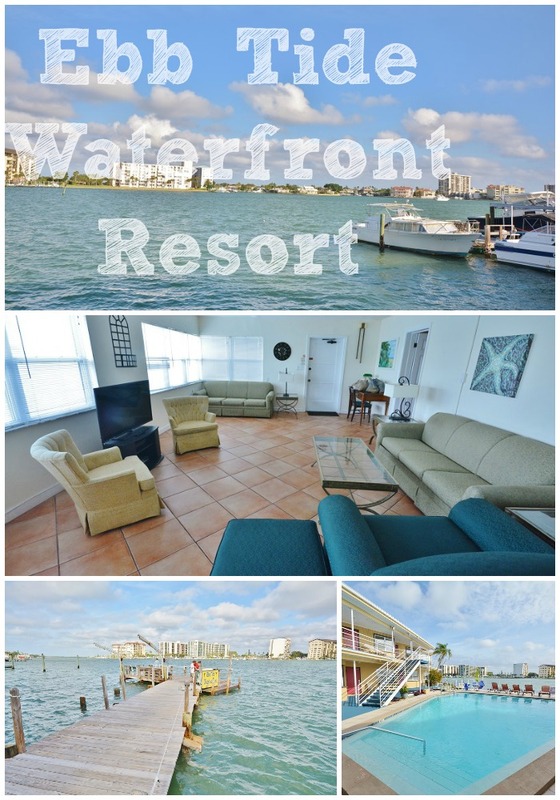 Whether traveling alone, with children or as a couple, the Ebb Tide Waterfront Resort in Clearwater Beach offers peaceful accommodations at a great price. Prices will vary throughout the year, and Winter is their peak season, so look for bargains during warmer weather months throughout the year. Visit the Ebb Tide website for more information or to book your stay now. Our accommodations were provided for the purpose of review, but all opinions are our own. I wish I would have been able to join you at Ebb Tide. I'll have to keep this location in mind for my next snowbird adventure! Wow this place looks amazing and so beautiful! I'd love to spend quality family time here! What a gorgeous place to bring the family and share some time doing some awesome activities together, I love the water and the shell tree. Looks like an amazing place to take the family. Looks like a wonderful retreat! I am now totally motivated to go on a vacation. It is nearly 30 degrees BELOW zero, so a vacation is definitely needed. Wow! This looks really nice! Never heard of this before but would love to go someday! I love Clearwater. This spot looks like a real gem!